I was one of the lucky ones, born at a time before cynicism set in.... when hero worship wasn't something to be sneered at or condemned. In my youth, the explorers we read about in The National Geographic, or were told about at school, were the objects of unsullied, youthful admiration. The men and women we admired, were special, unreachable, unique. Scott Of The Antarctic, Amelia Earhardt, Churchill, Florence Nightingale and the rest. I remember taking the train to London as a kid, to be in the crowds that welcomed Soviet cosmonaut Yuri Gagarin to Britain after that first manned space flight and thinking of him, standing there on the podium, as almost superhuman. Of course he wasn't... he was very human, but like all the other great explorers, posessing that unique something, that "right stuff" that put them out of reach of the mundane, ordinary existence, that we and our parents occupied. We heard about the Columbia disaster on Saturday afternoon, a cruelly bright and crisp winter's day. And for us here in Britain, the implications behind the tragedy were entirely human. Science could wait. 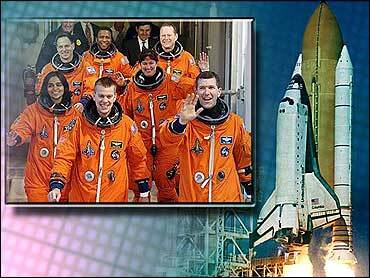 We were thinking of the relatives and the friends of those who had died aboard the shuttle. For all of us, a continent away, who share your sense of loss and who believe that those seven men and women, each of them special as individuals, were made of "the right stuff"... the astronaut Greg Johnson got it right when he said that they were pioneers, blazing a trail and making their way. They travelled the same path as Columbus and Cook and we should remember them with pride and gratitude. But the extraordinary thing about the human condition is that there are others and there will be more still... eager and brave enough to pick up the challenge and take the next steps. After all, they are the special ones and they're there now, in the wings, waiting... the people with "the right stuff", like the men and women who crossed an ocean to found your nation.